How can I find hotels in different Markham neighborhoods? 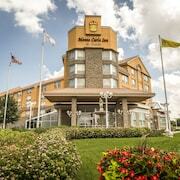 Markham offers travelers and vacationers an abundance of first-rate hotel and apartment possibilities to choose from. Expedia's extensive and up-to-date database features 21 hotel options within a 0.1-kilometre (0.1-mile) radius of the heart of Markham. Some hotels that are not all that far from the center of Markham are the Hilton Toronto/Markham Suites Conference Centre & Spa and Diamond Vacation Homes - Markham. Check out The Ritz-Carlton, Toronto and also the Four Seasons Hotel Toronto. The Ritz-Carlton, Toronto can be found 30 kilometres (19 miles) away from the middle of Markham. The Four Seasons Hotel Toronto is situated 25 kilometres (16 miles) away. Two other Expedia-listed alternatives in this area include The Hazelton Hotel Toronto and the Windsor Arms Hotel. If time allows, you should travel to other parts of the Southern Ontario region. Explore Southern Ontario's traditional villages, churches and art museums. Lovers of the great outdoors should also make the time to to admire the region's beaches, coastal plains, forests and lakes. In this section of Canada, visitors may also enjoy skiing, cross-country skiing and snow shoeing. 20 kilometres (12 miles) from Markham is Vaughan, where visitors can enjoy the Vaughan Mills Mall and the National Golf Club of Canada. 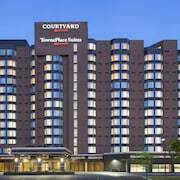 The Residence Inn by Marriott Toronto Vaughan and Homewood Suites by Hilton Toronto Vaughan are just some of the accommodation options in Vaughan. 25 kilometres (16 miles) to the northwest of Markham is Newmarket, home to the Best Western Voyageur Place Hotel and Newmarket Inn. Upper Canada Mall and the Newmarket Theatre are a couple of the most popular places to experience when visiting Newmarket. Toronto is located 25 kilometres (16 miles) away from Markham. While you are in the area, make sure you investigate the CN Tower, the University of Toronto and the Hockey Hall of Fame. You might like to also visit the Casa Loma and the Royal Ontario Museum. The Ritz-Carlton, Toronto and Four Seasons Hotel Toronto are just a couple of recommended Expedia-listed accommodation options in Toronto. Pearson International Airport is situated 35 kilometres (22 miles) from Markham. If you choose to stay nearby, you can easily book a night at the Sheraton Gateway Hotel In Toronto International Airport or the Residence Inn by Marriott Toronto Airport. Before you begin planning your Markham vacations, you’ll need to decide where you’d like to stay. 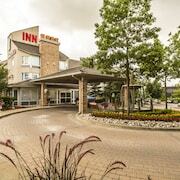 If you’re searching for a historic location, try one of the Markham hotels near Main Street Unionville. This quaint village offers a 19th-century atmosphere, and it’s a fantastic spot to spend a relaxed afternoon. You’ll also find some great deals on the hotels in Markham close to the Market Village and Pacific Mall, but for the best-connected retreat, search for an inn just outside the city centre. This is a fantastic jumping off point for explorations of nearby Toronto, and the accommodations here are generally inexpensive. When you’re ready to book your getaway, make sure to use the trip-planning tools at Expedia.ca to track down offers, compare prices, and reserve a space at one of the best hotels in Markam, Ontario. 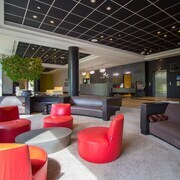 Need to book more than just a room? We can help with that, too. Simply browse our selection of flights, vacation packages and local activities to find the latest info on the city’s best deals. It’s the most laid-back way to plan a vacation.